Photography of the 'great outdoors' and of the people who relish in its grandeur - is something that I enjoy very much. I am passionate about using photography to record the atmosphere and ambience of my subjects - be that the upland landscape of Dartmoor to photographing surfers, kayakers and climbers from an 'up close' aspect. "He stood breathing, and the more he breathed the land in, the more he was filled up with all the details of the land. He was not empty. There was more than enough here to fill him. There would always be more than enough." I also work part time as a Teacher & Tutor of Mathematics, Science and Physics. I enjoy personal photography in my spare time, often incorporated within my explorations, adventures and wanderings on the moors and the coast. 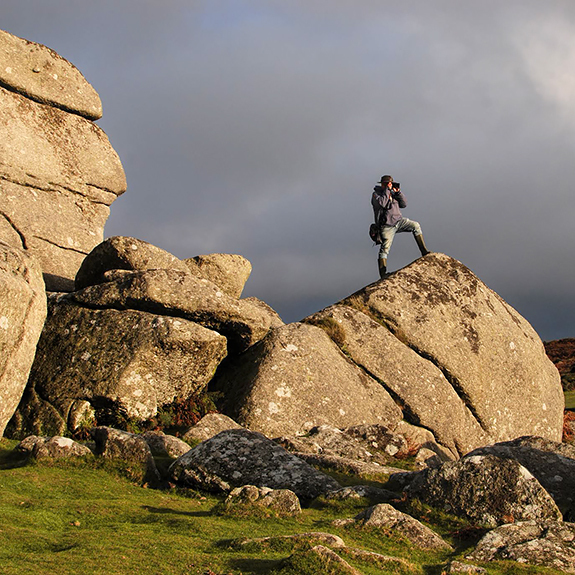 Phil is available at weekends, some weekdays and summer evenings, by request, to run bespoke Landscape Photography Workshops for Beginners and Improvers, in Dartmoor National Park and /or South Devon coastal areas. Treat yourself or a friend or family member for their Birthday maybe? Trips further afield are possible to places such as the Cornish Coast, Dorset's Jurrasic Coast, The Mendip Hills, Blackdown Hills, Exmoor, Wye Valley or Gower Peninsula. I am a qualified kayak instructor, expedition leader, rock climbing instructor and a qualified science teacher (holding a PGCE Teaching qualification) with a degree in Physics (with particular interests in geomorphology and astronomy). Many thanks to the following companies for their sponsorhip of outstanding camera carrying products, which come highly recommended by Phil after repeated use over the last few years (you can read reviews that I have done of their innovative kit in my blog and at Ephotozine). Devon Life magazine Jan 2013 - featured large scale image of my 'Emsworthy Barn' photo in article on the Dartmoor NPA Winning Landscapes photo competition. Wed Magazine (summer 2010) – featured some of my ‘high dynamic range’ photography for an article on UK Honeymoon locations. Plymouth Herald – ‘picture of the day’ on seven occasions. Canoe Focus – one winning entry, one highly commended and numerous other inclusions. 247 Magazine – street art photography featured. Reconnect Magazine - 8 features on photography and an article published about 'Green Lanes' along with further photos and 2 front cover photographs. Elle magazine (Italia) - photography featured in an article on Romany Caravans & Showman's Wagons. Totnes Times – feature on 3-D graffiti mural created for Totnes Kayaks.